Coats for All Shapes, Body Shapes that is. Winter is here now and most of us are spending a large part of our lives in coats. Now that you understand your body shape the next question is “What is the best coat for me?”. Here are the five basic shapes and the best coat silhouette each one. Your broad shoulders give you a great natural posture and make coats look great on you. The object is to create more of a curvy silhouette. Choose a fitted and belted jacket. Big flap hip pockets add to the look you are going for. Don’t get carried away with fancy or oversized collars – stay classical. Going with a small check pattern will also draw attention away from the shoulders and add to the overall look you want. You have the shape everyone is going for just don’t lose it in the bulkiness of the coat. Keep the coat a fitted one with a v necked collar. Emphasize the v neck and wear your coat with the collar button open – use a scarf to keep your neck warm. You can sport the hip pockets and wide collar – just as long as the waist is fitted snugly. Don’t chop yourself in half with a tie belt. It will trash your silhouette. If you wear a belt make it a buckled one over a fitted coat. Like everything else in your wardrobe, you along can play with all the unique and different collars and lapels around. The funnel shaped collar is carried off best by you as are huge lapels and double ones. Wear all the scarves in all their unique ways that you want. With all your focus on the face and shoulders just let the coat skim your waist and hips and fall smoothly. Like the rest of your ensembles, keep it flowing. Your shape handles belted coats the best – letting the material puff out above and below the belting. Add hip pockets and dynamic lapels and you are set. Because you are usually tall for your size the three quarter length coat is best for you and keeps you in proportion. Above all, buy a coat you love and feel great in! Dress to your likes and not to our shoulds and, above all, have fun! What is your Bodyshape?? The answer in 3 simple steps. What is your body shape? Previously I described the 5 body shapes and guidelines on how to dress. Next step is determining your particular shape. That will take 3 easy steps with 3 simple measurements. Step 1 – Prepare to measure. In addition to a tape measure, there are a few other things you will need to before measuring. First, leave your jeans for another occasion. They are bulky and act as a girdle. Third, gather up your tools. elastic. To determine where your waist is. a mirror. This will help you find where you are measuring. A good friend would be a good substitute. 1- Bust. Making sure the tape measure is level with your bust across your back measure around the widest point of your bust. Do NOT pull the tape measure tight. 3 – Hips. The dreaded hip measurement is next. Hips in this context is the widest part of your body below your waist. Look at yourself sideways in the mirror to find this line and measure it. Do NOT pull tight here. 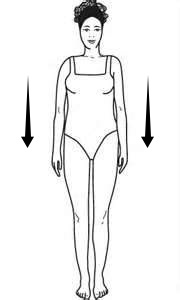 Step 3 – What Bodyshape are you? You are a Lady Diva (aka Hourglass) if your bust and hips are within 2 inches of each other and your waist is 7 – 8 inches smaller. You are a Lady Peacock (aka Pear) if hips are more that 2″ larger than your bust and waist is smaller than bust. You are a Sassy Gal (aka Inverted Triangle) if your bust is more than 2 inches larger than your waist and your waist is smaller than your bust. You are an Earth Goddess (aka Apple) if waist is larger than or equal to bust. You can be on a scale between two shape. Claim ownership of both shapes. I will clarify that on an upcoming post. Right now, you can you can go to my website Istina Design to read up further on what your particular body shape will look best wearing. You’re not a Rectangle! You are a Lady of Movement!! You’ve checked your measurements and they are less than 8” difference between your waist and bust and your waist and hips. (Want an assist in figuring out that shape then try my BodyShape Finder.) In the old paradigm you would be a rectangle. Talk about BORING!!! You don’t even merit a fruit taste! Not so fast!! You look gorgeous in clothes that flow and move around your body. You are a Lady of Movement! Look for garments that have a flow and movement of their own. Let your clothes put the visual curves in your body. Look for jackets that draw the eyes to the waist. It could be a single button closure at the waist of a belted jacket. Draw the eyes to your bust with short fitted jackets. You are one of the few shapes that can wear soft drapey tops that accentuate your bust. Stay away from the boxy jackets. You look best in flowing and curving lines. Stay away from the boxes – this includes the boxy look created by double breasted and unstructured jackets and tops. Draw attention to your shoulders with shoulder or yoke details. Use contrasting fabric and drapey fabric. You can get away and actually look great in styles that draw the eyes across the shoulders and widens them. Accompany that with a waist cinching detail and you rival the Lady Divas (aka Hourglasses). The same suggestions apply to your waist and hips. Flowing and billowing and curving around your body.Flared and mermaid skirts are great! Add flowing pleats and gores. Hem your skirts with pointed handkerchief or asymmetrical hems to add to the movement. But those same legs make pants one of your best choices. Have fun. Sport baggy hip pockets. Wear crop pants or capris. Go super wide and floppy. Skinny jeans – not so good – unless you want to emphasize the skinny and long and lose all that movement that makes you so interesting. Add curves and stripes (just not the narrow vertical jailhouse stripe) to give curves to your shape. Check out your body shape at Find Your Body Shape. Then download your specific shopping guide from my Shop.